Viakoo's sole focus is on video network infrastructure behavior and the reasons video streams fail. As computer scientists, Viakoo's engineers have been troubleshooting customer on-premises video networks for a long time, and from that knowledge have developed automated cloud-based solutions for ensuring 100% uptime (a growing requirement in many organizations where video surveillance is mission-critical). 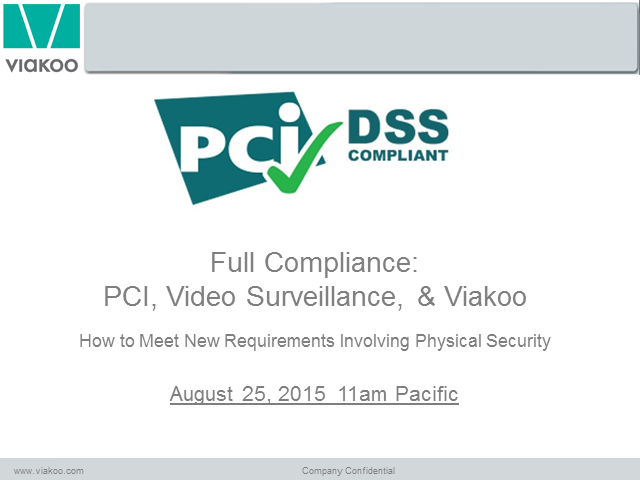 This webinar covers what you need to meet new requirements under PCI 3.1 involving physical security. Requirement 9 in particular has changed significantly with respect to integrating video surveillance into the overall PCI scope, as well as Requirement 2 with respect to storage. Join this webinar and learn how to ensure you remain compliant with these changes. Managed Service Providers have a key role to play in ensuring ALL IP-based technology used by their customers is working and meeting their needs. Join this webinar and learn how MSPs can increase monthly recurring revenues with Viakoo's services and subscription offerings. Gain more customers and make more money by providing a critical service that many customers are finding falls between the gaps of their IT teams and physical security teams. How Secure is Your Security Video Network? Have you ensured that your security video network is not going to be the next place hackers breach your security? Not only is this a means of entry into your overall network, but a major source of risk due to losing control of your organizations "eyes and ears". Download the 12 point checklist from Viakoo, and join the discussion on how to plug holes in security video networks. IP camera networks used for video surveillance are expected to be up and running 100% of the time, but they lack the instruments, diagnostics, and "warning lights" to properly manage them. Viakoo solves that problem.